Whether it be a birth day, anniversary or publication date of a seminal work, the Bar None Group will revisit these 40+ quotations from time to time -- quotations that inspire one to write, read, explore and embrace literature. To mark this new feature we begin with the aptly named "poetry..." plaque commemorating the work of Gwendolyn Brooks (1917-2000). "A poem doesn't do everything for you. thus making the poem serve you." Inspired by Winnie Mandela, Song of Winnie from 1988 continued Gwendolyn Brooks social observations through her poetry. A commentary that began with the publication in 1945 of, A Street in Bronzeville. Bronzeville is a neighborhood in Chicago's South Side where the Kansas born Brooks called home for most of her life. 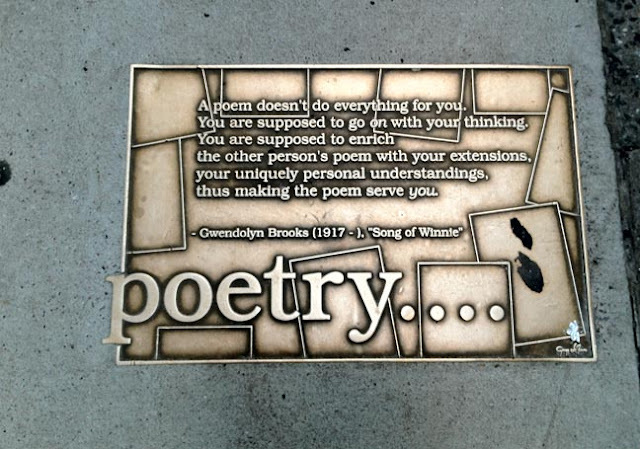 Gwendolyn Brooks won a Pulitzer Prize for the 1949 collection of poems, Annie Allen becoming the first African-American to win a Pulitzer in any discipline. Langston Hughes said of Annie Allen, "The people and poems... are alive, reaching and very much of today." After the publication of Winnie in 1988, Brooks remarked to an interviewer, "I want to write poems that will be non-compromising. I don't want to stop a concern with words doing good jobs, which has always been a concern of mine, but I want to write poems that will be meaningful . . . things that will touch them."